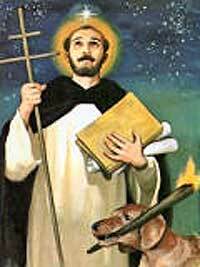 Today is the Feast of St. Dominic, the patron Saint of scientists. This is a perfect opportunity to correct the false but unfortunately common perception that there is a conflict between science and religion. Part of the reason for that is the poor state of knowledge of both science and theology in the modern world. One of the purposes of this blog is to promote the mutually reinforcing methods of finding ultimate Truths through faith and science. This entry was posted in Reason and Faith and tagged Blaise Pascal, Francis Collins, George Lemaitre, Gregor Mendel, Johannes Kepler, John Polkinghorne, Michael Faraday, Nicolaus Copernicus, reason, Robert Boyle, science, St. Dominic, teilhard de chardin. Bookmark the permalink. Wow wow wow… another treat… Thank you! Thank you Claire. As I was pulling it together I was surprised with how easy it was to come up with great scientists of the faith. Great compilation. Thanks for putting it together. When a scientist seeks the Truth, he finds it Everywhere. Most of All, He finds it in Himself/Herself. Thank you Erik. I agree and appreciate all of your insights and your outside the box thinking. Hi William, I found your link on Erik’s blog. I love Catholic theology and especially the communion of the saints aspect of it. Love your blog and share your love of the mingling of theology and science. Thanks too for the follow. Thank you so much for stopping by. I am glad we virtually connected as you have a wonderful blog that I look forward to reviewing in more detail. Despite 16 years of Catholic education and a year at a Catholic college as a biochemistry major, I never knew this! Thank you for sharing! Meg, thanks for stopping by! From your blog it looks like you have quite an adventurous life :-). I look forward to reading more about your adventures. Missed this post somewhere along the line. Lovely!